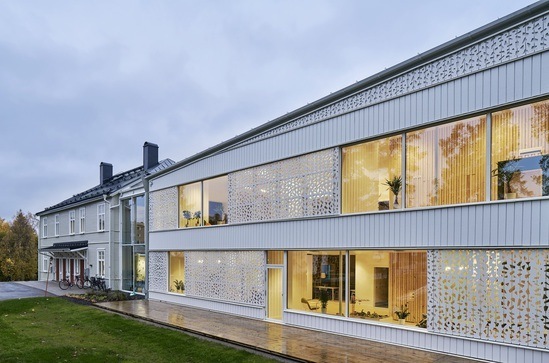 Hjältarnas Hus (House of Heroes), a hospital facility in Norrland, Sweden has been renovated extensively with wood-based products, owing to the universal belief that natural materials help people heal better. This serene and homely sanctuary functions as a temporary home for families with young children suffering from long-term illness. 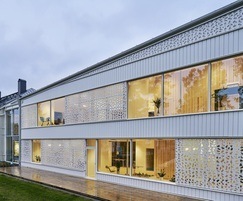 Designed by White Arkitekter, the building features MEDITE TRICOYA EXTREME (MTX) panels along the outer walls, while the roof is structured from glue-laminated wood (glulam), overlaid with white metal sheets. The building’s interior walls and ceilings are clad with fir. MTX was specifically chosen due to its "outstanding qualities", including being the only wood composite panel guaranteed to last 50 years in an external environment, even when in contact with moisture. Equally importantly, it is manufactured using no added formaldehyde; extremely important when considering its purpose as a recovery centre. Stuart Devoil, Head of Marketing and Brand for MEDITE SMARTPLY commented: "This wonderful project demonstrates the full value of our product, and great understanding of timber as a building material. Not only will the product help to create a fantastic environment for children to live in, but it will not degrade, meaning it will be there for years to come." As MTX is fully FSC certified, it was a natural choice for a building designed to meet the highest environmental standards. 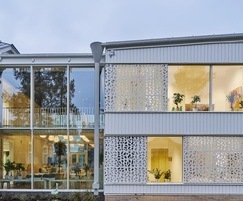 Generally, in using mainly timber for this build, Hjältarnas Hus and the Sweden Västerbotten Healthcare Council, who collaborated on the project, have eliminated approximately one tonne of carbon dioxide per one cubic metre of solid material, from being released into the atmosphere, compared to using materials such as concrete or brick.